The school of the future is 20 years from now? I recently read this article in the Wall street journal. It is a prediction of the future that might be closer than most educator think. I’m predicting that she is right in many of her assumptions here. What do you think? Is this school in 20 years? 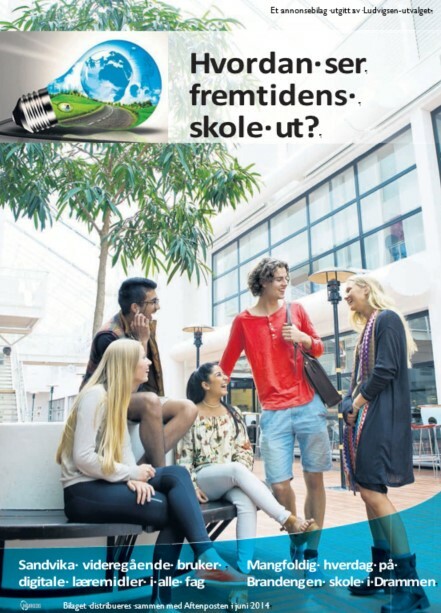 Our school was recently showcased in the national newspaper in Norway as the school of the future. According to this article we have a long way to go. And I think somehow this is the direction we need to take. Read full article here. When I look ahead to the schools of 20 years from now, what I see are institutions that not only will be more diverse, but will in every way look and function differently from the schoolhouses of today. The classrooms of the present will go the way of the banks of old. Just as new technologies allowed us to access banks through ATMs instead of going to the teller in the lobby, education will be revolutionized through ever-expanding technologies and the rapid flow of information. Those two forces will change the trappings of the system we know now, resulting in a consumer-driven education. Parents, for one, will have access to the flow of data, allowing them to help their children find the education that best fits them. Buyers, meaning the parents and students, will be in control of the education, selecting from an à la carte menu of options. Gone will be the fixed-price menu, where a student attends a school based upon geography and is offered few alternatives. Students and their parents can take their state and federal dollars and find an education that best suits them. For many Americans, this revolution will mean home schooling. For others, it will mean accessing coursework online at any time. For all students, this will mean more individualized learning. Like parents, teachers also will have real-time data. They will use it to create the best strategies for educating a child. They will build a plan that is customized to a student’s needs. If a student, for instance, does not grasp English, the plan will concentrate on acquiring that necessity as fast as possible. If a child trails in reading, the strategy will lead to quick interventions. If a child is outpacing her peers in math, the plan will enrich her learning so she can move even further ahead. The individualized approach to education will serve children in another important way. Instead of moving as part of a group from grade to grade, a child can move ahead when ready. The concept of grade level especially will change in high school. Students will not think of themselves as freshmen, sophomores, juniors or seniors. They will be grouped by their level of learning, regardless of age. Of course, they still must master the basics of reading, writing, math and science to graduate. But perhaps a 15-year-old is learning with 17-year-olds on math, while working with 16-year-olds on reading. The data will guide where each child best fits. Each student’s competencies will be a guiding force in the coming world of education. In fact, employers will increasingly credential students. Many companies will test prospective employees to see if they have the requisite knowledge and attributes. “Badging” students particularly will prevail in the worlds of science, technology, engineering and math. Employers will determine whether a young person is ready, not just the university. From early ages through college, data and information will guide students and parents through this new world. They will look for the best education options like travelers today look for a Trip Advisor rating. The only reason we will not reach this better place is if the status quo prevails. But the market-oriented forces that have changed so much of our world—competition, customization, technology, modern management and customer focus—are too powerful for even an entrenched educational establishment to resist. These principles also will change our education systems. In turn, those systems will well serve America’s diverse student body, preparing each student for a world that will require them to think creatively, reason through problems and respond to fast-changing circumstances.